Not a week goes by that I don’t get at least three questions about global warming. Frequently, what underlies these questions is a concern, and sometimes outright panic, that all the ice fields and glaciers in Antarctica, Greenland, and the Himalayas will melt and drown out all the coastal cities of the world where over a third of world’s population currently lives. Adding to this concern and panic is the worry that global warming will raise summer daytime temperatures in inland cities to such a degree that millions of people without air conditioning will die from heatstroke. My first response to global warming questions is to remind inquirers that we are in an ice age cycle. That cycle, driven by sinusoidal (wave pattern) variations in the ellipticity of Earth’s orbit about the Sun and in the tilt of Earth’s rotation axis, implies that inevitably the global mean temperature will rise and fall in response to the cycle. 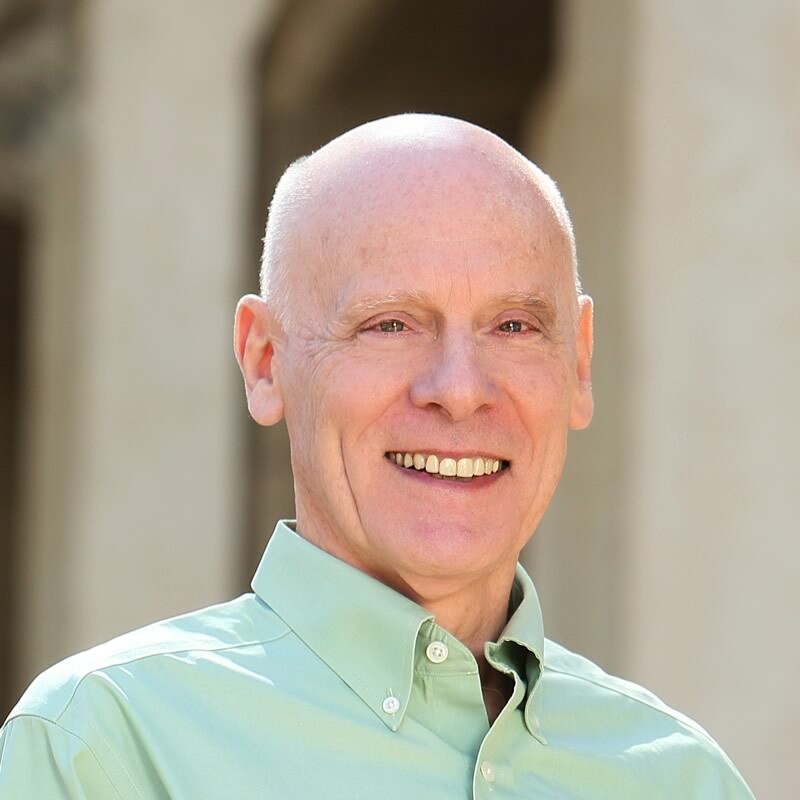 My second response to global warming questions is that for the past 2.6 million years whenever the global mean temperature rose by 2–3°C (3–5°F) above the present value, Earth experienced a rapid temperature drop that brought on an ice age that covered 20–23 percent of Earth’s surface in ice hundreds of feet thick. 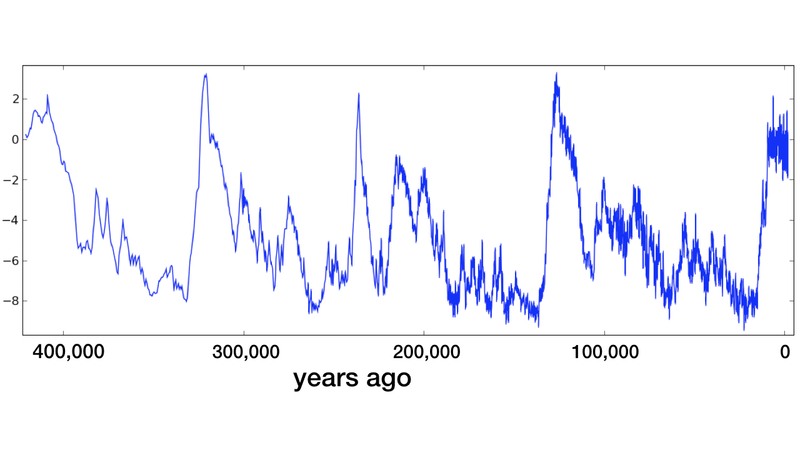 Figure 1 shows how throughout the past 400,000 years such global warming temperature peaks has quickly and consistently brought on temperature drops that resulted in an ice age. Figure 1: Global Mean Temperatures throughout the Past Four Ice Age Cycles. The numbers on the Y-axis are degrees Celsius relative to the present global mean temperature. Image credit: Robert A. Rohde, Global Warming Art Project, CC by SA. The data indicate that we should be much more concerned about an extended period of global cooling than we are about a brief episode of global warming. In order to better prepare for and ameliorate the impact of an extended period of global cooling, we should seek a resolution to the paradox of how brief episodes of global warming bring on long periods of global cooling. In the July 2018 issue of Geophysical Research Letters, researchers published two papers pointing to significant steps toward resolving that paradox and gaining the understanding we need for our future well-being. 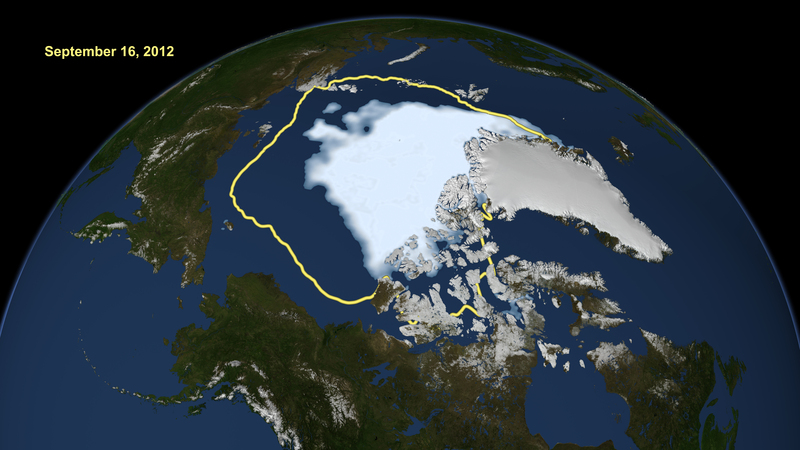 Figure 2: Arctic Sea Ice Extent on September 16, 2012, Compared to the Average Minimum Extent over the Past 30 Years (yellow outline). Image credit: NASA/Goddard Scientific Visualization Studio. In a new study, a team of four geoscientists has demonstrated the much more remote response (in other words, what would happen closer to the tropics where most people live) to Arctic ice loss.5 The team investigated the global climate outcomes from the abrupt loss of Arctic sea ice using the computer simulation, Community Climate System Model version 4, in two different configurations: (1) a thermodynamic slab mixed layer ocean, and (2) a full-depth ocean that includes both dynamics and thermodynamics. In particular, the simulations showed that the surface and subsurface ocean layers down to a depth of at least 200 meters are warmed considerably. This enhanced ocean water warming is much more pronounced in the northern hemisphere than in the southern hemisphere. The simulations predict that precipitation over the northern mid-latitude Pacific Ocean and over the adjoining landmasses dramatically increases. Outcomes from the team’s simulations were remarkably consistent with the events of the last ice age. The advent of the last ice age began with snow and ice accumulating over western Siberia and Labrador. Soon thereafter all of Canada and more than two-thirds of Siberia became covered with ice more than a thousand feet thick. At maximum extent, 23 percent of Earth’s surface was covered with a thick layer of ice during the last ice age (see figure 3). 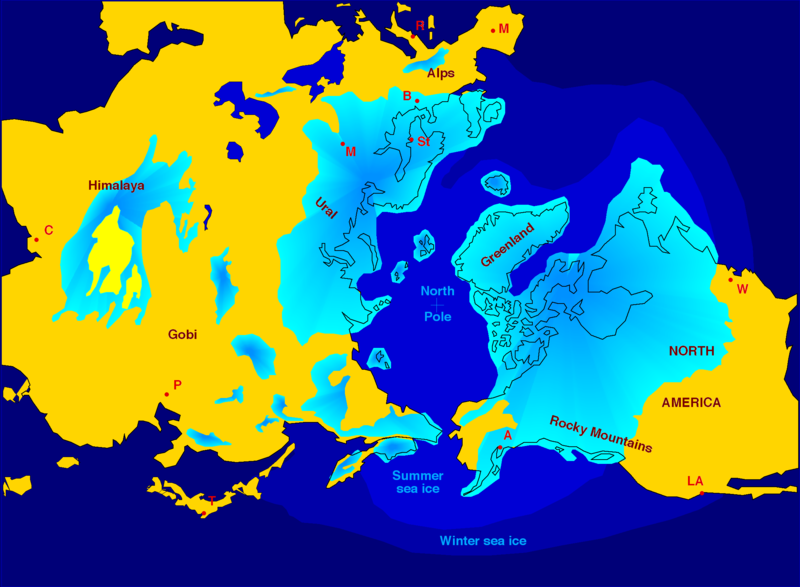 Figure 3: Maximum Extent of Thick Ice Cover of the Northern Hemisphere During the Last Ice Age. The turquoise-colored parts of the map indicate those regions covered by ice at least 3 kilometers (2 miles) thick. Winter sea ice extended as far south as Mexico in the Pacific and North Carolina and Spain in the Atlantic. Image credit: John S. Schlee, United States Geological Survey and Hannes Grobe, Alfred Wegener Institute for Polar and Marine Research. Today, both northern Canada and northern Siberia, in spite of a 3.5°C (6.3°F) rise in temperature since 1900, are more than cold enough for snow to remain frozen and accumulate to form large sheets of ice. The reason such ice sheets are not forming now is that both northern Canada and northern Siberia are deserts. Neither region gets more than the equivalent of 10 inches of precipitation. The melting of the Arctic ice cap will dramatically increase the precipitation over northern Canada and northern Siberia. Much more snow will fall upon those regions, causing huge ice sheets to form there. Meanwhile, as the study produced by the four geoscientists demonstrates, within two or three decades after the melting of the summer Arctic ice cap, precipitation will dramatically rise over the landmasses adjoining the North Pacific Ocean and, to a lesser degree, the North Atlantic. Because of the global cooling that will result from northern Canada and northern Siberia being covered with giant ice sheets, much of the precipitation falling upon southern Canada, southern Siberia, northern United States, and Western Europe will be snow. This additional snow will extend the coverage of Earth by thick ice sheets to the degree displayed in figure 3. According to the geoscientists’ research and the other studies cited here, we could see the dawn of the next ice age within a century and its full onset within a millennium. In the same issue of Geophysical Research Letters, three scientists at the Norwegian Institute for Air Research show that mineral dust deposition in the Arctic conceivably could bring about an even more imminent dawn of the next ice age.7 Because of this mineral dust’s low albedo (reflectivity), it warms up the snow and ice upon which it falls. The three Norwegian scientists calculated that mineral dust deposition warms up the Arctic ice and snow by 0.135 watts per square meter.8 This extra heat implies that the Arctic ice cap could melt away a lot more rapidly than what calculations based solely on enhanced greenhouse gases predict. Obviously, the full onset of the next ice age will have dire consequences for Canadians, Russians, and other people living in northern latitudes. In my next blog post I will describe how the arrival of the next ice age will bring about multiple consequences for global human civilization. In the third post in this series, I will describe what steps we humans can take to prolong the onset of the next ice age and how we should prepare for the inevitable. J. Richter-Menge and J. T. Mathis, “The Arctic: a. Overview,” in D. D. Arndt et al., “State of the Climate in 2016,” Bulletin of the American Meteorological Society 98 (August 2017): S129, https://doi:10.1175/2017BAMSStateoftheClimate.1. D. Perovich et al., “5. The Arctic: c. Sea Ice Cover,” in D. D. Arndt et al., “State of the Climate in 2016,” Bulletin of the American Meteorological Society 98 (August 2017): S131–S133,https://doi:10.1175/2017BAMSStateoftheClimate.1. T. F. Stocker et al. (editors), Intergovernmental Panel on Climate Change (2013), Climate Change 2013: The Physical Science Basis: Chapter 4—Observations: Cryosphere (New York: Cambridge University Press, 2014): 317–82, https://doi:10.1017/CBO9781107415324.012. Clara Deser and Robert Tomas, “The Seasonal Atmospheric Response to Projected Arctic Sea Ice Loss in the Late Twenty-First Century,” Journal of Climate 23 (January, 2010): 333–51, https://doi:10.1175/2009jCLI3053.1; J. A. Screen and I. Simmonds, “The Central Role of Diminishing Sea Ice in Recent Arctic Temperature Amplification,” Nature 464 (April 29, 2010): 1334–37, https://doi:10.1038/nature09051. Kun Wang et al., “Fast Response of the Tropics to an Abrupt Loss of Arctic Sea Ice Via Ocean Dynamics,” Geophysical Research Letters 45 (May 16, 2018): 4264–72, https://doi:10.1029/2018GL077325. Ivana Cvijanovic et al., “Future Loss of Arctic Sea-Ice Cover Could Drive a Substantial Decrease in California’s Rainfall,” Nature Communications 8 (art. 1947) December 5, 2017, https://doi:10.1038/s41467-017-01907-4. A. Kylling, C. D. Groot Zwaaftink, and A. Stohl, “Mineral Dust Instantaneous Radiative Forcing in the Arctic,” Geophysical Research Letters 45 (June 2018): 4290–98, https://doi:10.1029/2018GL077346. Kylling, Groot Zwaaftink, and Stohl, “Mineral Dust Instantaneous Radiative Forcing,” 4290. If an ice age is coming soon, how will our lives be affected? In my first blog post in this series, I described the latest scientific research that demonstrates how continued global warming will bring on the next ice age and approximately when we can expect its onset. In this post I will describe the consequences the onset of the next ice age will create for modern civilization. In the final post in this series I will briefly summarize our options for delaying the dawn of the next ice age and review what preparations we should make ahead of its arrival. Why do you go to the movies? For many people, it is for sheer enjoyment or to escape from life’s pressures for a few hours. One of the things I most enjoy in life is learning something significant about truth and reality. Therefore, I like watching films that are true stories or based upon them, and especially ones that make me think about the deep questions of life.